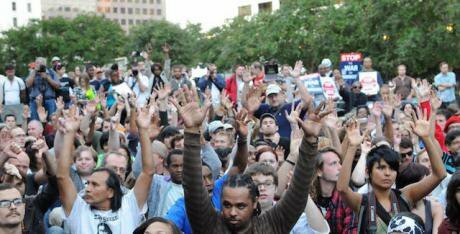 Occupy Atlanta.While commentators wring their hands in despair over the future of news journalism, governments everywhere struggle to engage citizens in meaningful ways. Although a healthy democracy consists of people, government and media, right now they predominantly operate as separate entities, influencing and agitating each other through elections, scandal or protest. As with most things, the internet is having a disruptive influence on the status quo. It has been whole-heartedly embraced by the people, and government is slowly digitising its services, yet publishers have been hard hit as new media players have rapidly cannibalised their revenue. As a result, newsrooms are in crisis. The resources and might of journalism has been slashed by nearly half in just a few years. Mother Jones recently reported that in 2015 there were 40% fewer journalists working in newsrooms in the US than in 2007. So what can be done? After working with governments and community groups around the world to engage citizens using social media, I’ve come across an idea. What if professional news media could play a larger, and more active role in the ecosystem of representative democracy, and get paid for it? Diagram of The Sweet Spot. Design credit Bahadir Fenerci. All rights reserved. By uniting the spheres of media, government and citizens, we can see a crossover representing a golden opportunity – one that I believe is under-utilised. 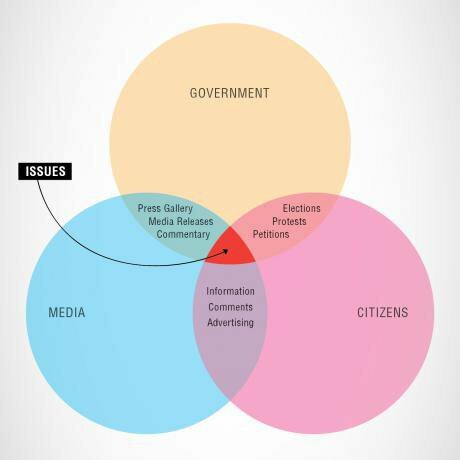 The common ground that government, media and citizens share are the issues. The newsworthy stories of the day cover issues that impact people, which in most cases, affects the government response. When an issue swells in importance, it becomes the focus of our attention. The media is attentive, the government is attentive and the citizens are attentive. What if we used this centralised focus to problem solve together? Introducing, ‘The Sweet Spot’. There are many reasons why we could all do with a little more Sweet Spot. - Government attempts at civic engagement often fall short of the desired outcome, with only highly motivated members of the community willing to jump through the hoops to participate. - Citizens have grown skeptical of what happens to their responses and suffer from consultation fatigue from a barrage of lengthy and thankless surveys. - Large and expensive engagement portals are complex and convoluted, failing to go where the people are. - Despite social media presenting a highly connected forum for two-way dialogue, it is generally a petri-dish for negativity and risk. Comments and tweets quickly turn into fiery slinging matches, making it hard to filter out constructive feedback. - Civic leaders are not used to being so directly connected to constituents in such a public way, and it’s frightening for most of them. As a result, some government groups are opting to go in through the backdoor, by using social media listening tools, like Cambridge Analytica or Crimson Hexagon. It’s not only creepy, but highly weighted in favour of those most outspoken, once again magnifying the voices of the ‘squeaky wheels’ over the ‘silent majority’. These monitoring tools also exclude the benefits of exercising the civic muscle gained when bringing people together, to openly share opinions and grow awareness of opposing viewpoints and considerations. Similarly, telephone polls do nothing to activate the personal agency of each citizen, because they only invite a select few to provide input. Contrast this with the ability of the media to frame the discussion, capture large audience interest and get the community talking. They provide the context necessary for informed debate, ideally in a neutral way, so that people can be educated about the issue and motivated to act. After all, the media are professional attention seekers, so are far more capable of bringing the greatest traffic and response rates. Newsroom attempts at interactivity have been less effective, with many publications forced to remove their comment sections after being plagued by uncivil dialogue. Yet recent interactive polls implemented across a variety of news sites indicate the public’s eagerness to express their views. The poll results cannot be used effectively by government because it lacks the research methodology required to substantiate the numbers and provide the depth of insight that can assist decision-makers understand what the majority of the public want. In consideration of these challenges and opportunities, we set out to see if we could use The Sweet Spot by embedding smart polls that capture the depth of insight and reach that make the numbers more meaningful. The Mayor of San Luis Obispo, Heidi Harmon, was willing to come on the journey with us. After winning the Mayor’s seat last year by 47 votes, she said in her election night speech she wanted to hear from all members of the community to solve issues together. Given the small city of 48,000 people is the 5th most expensive place in the USA, we planned a poll asking citizens about how development, rent control and tiny houses might impact affordability. Images from recent poll in San Luis Obispo. Courtesy of Poll Town. All rights reserved. The poll ran for 7 days, gained extensive media coverage and had the town talking. Over 2% of the population submitted their views via the poll. If it was rolled out in New York, this would mean 200,000 took part. The quantity of responses quadrupled in number of participants compared with other similar forms of civic engagement hosted in the city. 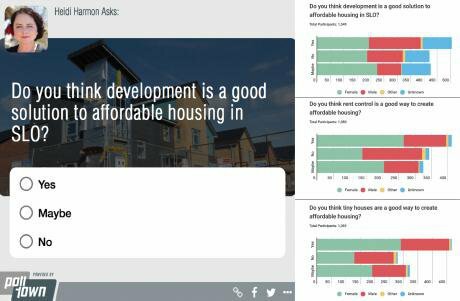 Once the poll ended, the results were bundled into an easy-to-view format and shared back with the community, closing the loop and creating more awareness about what people are thinking about the issue. Although the people responded favourably, and Mayor Harmon now has valuable insights, the experiment with buying in-article media placement was not as successful. One local outlet was steadfastly against embedding a sponsored poll within their news stories for fear of perceived bias. This issue has come up in previous conversations with journalists and editors. Even labelling the poll with a “Sponsored by” message did not overcome the resistance. “The media’s role is to report on government, not help them”, the editor of a San Jose newspaper told me. While the media worry about potential audience backlash, Facebook has no qualms about placing sponsored ads in the middle of their newsfeed, so once again they steal the dollars from traditional media. Although I can understand the trepidation and fears of news editors, audiences are familiar with native advertising, especially when it’s clearly identified, it seems counterintuitive for media to be unwilling to experiment with different models of revenue and engagement. In a healthy democracy, people expect to be able to act, and if it’s online, interact. In the end, another local news outlet in SLO embedded the poll in the story without payment and the unwilling outlet still wrote a story about the poll and linked to it. Other media partners we’ve run trials with have been averaging 25% engagement by readers, showing people are drawn to something eye-catching, simple and informative. When coupling it with a research plan and strategic promotion and sharing, the results can be large-scale and impactful. In a healthy democracy, people expect to be able to act, and if it’s online, interact. If media is willing to host this kind of platform for engagement, then they might become a genuine civic hub, attracting greater audience attention and much needed revenue for the quality journalism our democracy depends on.